What’s the deal with Digital Art? Thirty-three year old Cory Arcangel was born in Buffalo, New York in 1978. He grew up with a strong interest in guitar, practicing 8 hours a day by age 17, and went on to study classical guitar at the Oberlin Conservatory of Music. He later switched his major to the technology of music. In 2000, during his time at Oberlin, Arcangel collaborated with Paul B. Davis to release a record of 8-bit music, entitled “The 8-bit Construction Set” under their chosen group name of the Beige Programming Ensemble. It was in a composition class he took with Pauline Oliveros that Arcangel grew artistically inspired by his interest in music technology, crediting Oliveros for his “fascination with finding artistic inspiration in unlikely machines.” Arcangel currently resides in Brooklyn, New York where he works as a computer programmer, web designer, and artist. He does not limit himself to one media but rather works in a variety, consisting of: drawing, music, video, performance, and video game modifications. His most common artistic strategy is that of appropriation, re-using existing materials, for example YouTube videos. His work explores the relationship between technology and culture. This video is an example of Cory Arcangel’s use of appropriation in which he has pieced together parts of numerous youtube videos to create a new piece that produces the classical guitar piece Paganini’s 5th Caprice. Initially, I found myself confused and unimpressed by his work. Without knowing his background and just simply seeing the video game aspect of some of his work, I thought I would not like it, due to the fact that I do not understand videogames and their popularity. As I looked further, I discovered the layer beneath the surface. He puts a lot of thought into his work as well as a lot of technical adjustments. 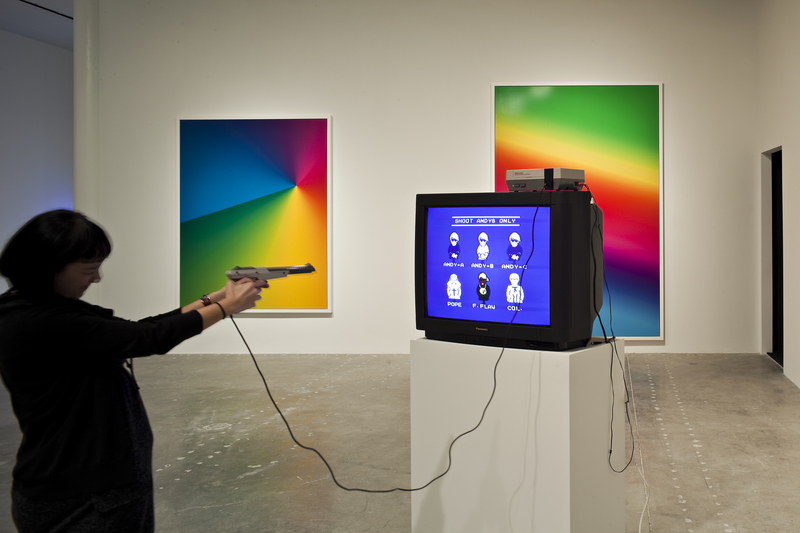 He modifies old video games by removing certain elements from the original games and then shares them with the general public through his exhibitions, allowing for an element of interaction. What also interests me about his work is that although there is a huge gaming and technology influence, Arcangel is not a gamer and is actually quite skeptical of technology. He stated in an interview with Mark Brown, the arts correspondent for the UK publication The Guardian, about his exhibition of tenpin bowling video games, “I’m more interested in what they represent and video game bowling seems to be the most absurd area of virtual experience. Bowling is a clumsy experience even when a human is doing it; so one level of removal is even more interesting. It is many levels of bizarre redundancy, the most bizarre I can think of – maybe with the exception of video game fishing.” In this particular exhibition, Arcangel exhibited 14 different bowling video games starting as far back as the 1970s Atari 2600 bowling game, to as recent as PlayStation and Nintendo versions. 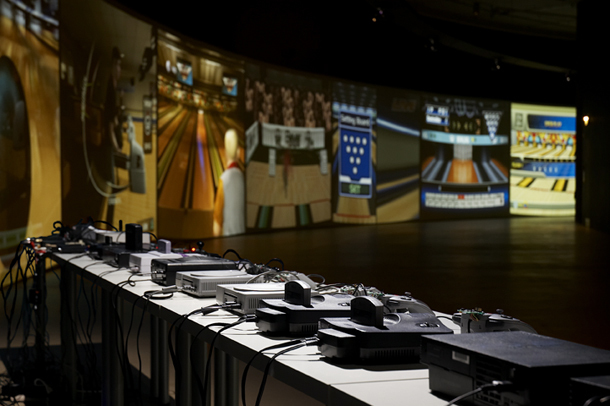 Arcangel installed 14 consoles playing continuous bowling games, with each controller modified by a microchip causing a result of constant gutter balls, making it impossible to knock a single pin down. Through something so taken for granted in our modern world such as technology, Cory Arcangel takes his art to a new level, bringing forward the imperfections and flaws in something so many people allow themselves to get sucked into. 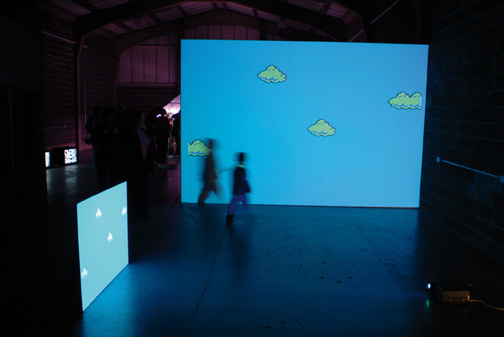 Cory Arcangel's Super Mario Clouds from his hacked Super Mario cartridge, 2003. Image courtesy of the artist and team gallery, New York. From Cory Arcangel's exhibit "The Sharper Image" at the Museum of Contemporary Art, a show consisting of Arcangel's work from 2002 to the present.